Location: Situated on the side of a valley 1km NE of the centre of Pontgarreg, S of a minor road to Blaencelyn. 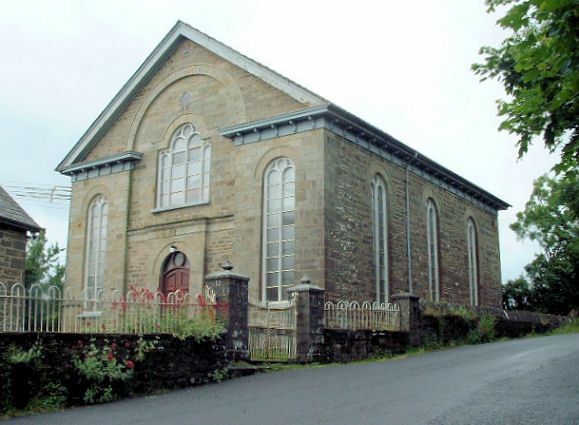 An Independent chapel built in 1813 and rebuilt 1848-9 at a cost of £700. The chapel was renovated in 1925 by D. Davies and Son, Henllan. The interior probably late C19. Squared sandstone ashlar with some square rubble to front, squared rubble sides, slate deep eaved roof with curved brackets from painted eaves band. Gable front with open pedimental form, the centre broken for big recessed arch breaking into pediment with stone voussoirs. Similar band and brackets to pediment sides, over ashlar side sections with long arched windows. Stone voussoirs and late C19 or C20 2-light timber tracery with roundel. Centre has squared rubble to ground floor each side of projected ashlar section framing arched doorway with stone voussoirs. C20 doors and crescent overlight. Simple cornice, broken forward over projection. First floor big timber-traceried window probably replacing small-paned Venetian window. 2-light arched centre with roundel and narrow flat-headed sides-lights. Stone voussoirs over. Diamond slate plaque above. Sides are squared rubble with three long similar arched windows, rear has two similar. Three-sided gallery with curved angles, long horizontal panels under sections of pierced cast-iron. Plain iron columns. Pews, raked in gallery. Timber boarded and panelled flat ceiling. Balustraded curved great seat. Pulpit with steps up each side, 2-panel front with Gothic panelling. Plaster arch behind. An architecturally well-handled front in classical tradition. Good interior in late C19 style. Spanning the Nant Fothau; on a bend in the minor road between Llwyndafydd and Blaencelyn. About 1.5 km SW of Llwyndafydd. On E side of bridge over Nant Fothau on by-road between Llwyndafydd and Blaencelyn. About 1.5 km SW of Llwyndafydd.